The What: Mersive has launched Solstice 3.0 featuring Multi-Room, the next generation of its collaboration product. This version allows users who are not in the same room to connect, share, and control content collaboratively across their enterprise network. The What Else: Solstice is designed to increase meeting productivity by reducing startup time, enhancing engagement, and yielding better meeting results. 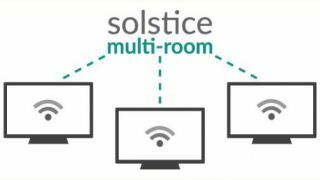 Solstice Multi-Room furthers these factors by enabling users to connect and collaborate across multiple locations. Solstice enables any number of users to connect to a meeting room display via Wi-Fi/Ethernet networks and share and control unlimited content from their laptops and mobile devices. Meeting participants can mirror their device screens, stream individual application windows, share videos, and more, creating an instant collaboration session. When two or more Solstice displays are synced in a Multi-Room session, shared content appears on all meeting room displays regardless of which location it is shared from. This flow of content across multiple locations improves the communication of ideas and information to facilitate effective collaboration among teams in separate meeting spaces. "Current audio and video conferencing offer multi-room connectivity, but because they limit content to a single thread, meetings are by default relegated to presentation mode," said Mersive CEO Rob Balgley. "Now with Solstice Multi-Room, users can have both connectivity for multiple rooms and multi-threaded content. This puts content sharing on a level playing field with audio and video." Solstice Multi-Room is additive to existing conferencing solutions, addressing the need for broader content sharing to complement traditional meeting audio/video connectivity. The Solstice Multi-Room user interface allows participants to input dial-in and/or video teleconference connection information, which other users can see and access as they join the Multi-Room session. A new chat feature is also included for messaging among users in Multi-Room meetings. In addition to the new Multi-Room capability, the 3.0 version of Solstice includes a streamlined user interface design, which further improves ease-of-use. "Collaboration among participants within a company is often content heavy, a use case that has been largely ignored by legacy conferencing services whose roots are in traditional telephony," said Mersive CTO Christopher Jaynes. "Solstice Multi-Room supports the trend toward a more ad-hoc meeting culture by increasing meeting awareness, making meetings easier to join, and allowing content to be shared collaboratively—now without geographical limits." The Bottom Line: Solstice 3.0 with Multi-Room will be on display for the first time at ISE in Amsterdam February 7-10, 2017. Solstice 3.0 with Multi-Room is scheduled for release in March of 2017. The new Multi-Room capability will be included as part of Solstice Pod Enterprise Edition products at no additional charge and with no new hardware requirement. Existing customers can update their Solstice Enterprise Edition Pods with active software maintenance to the 3.0 version of Solstice to access the Multi-Room capability.